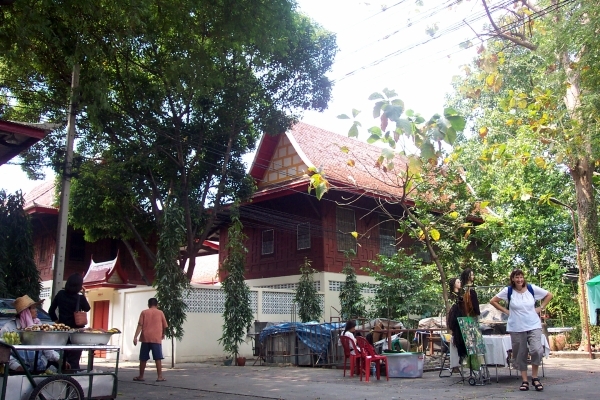 Tucked away in the center of the backpacker area near Khaosan Road is the temple of Wat Chana Songkram. People often use the temple as a shortcut between Khaosan Road and the river without ever stopping to take a closer look. Big mistake. Built in the eighteenth century, the temple has recently been renovated. If approaching the temple from the riverside area, you first pass though the shady courtyard (and parking lot) of the temple housing (kuti), where both the monks and lay workers for the temple live. The courtyard also usually has a few stalls for the tourists. From the kuti, you pass under a bell tower to reach the temple compound. The ubosot lies in a simple courtyard. If coming from the river, you are at the back of the ordination hall. The gable ends of the ubosot are beautifully decorated in carved gilded wood and mirrored tiles. Inside the ubosot, the altar is quite impressive with its golden Buddha image in front of a large fan, and ceremonial umbrella above. Of special note are the elephant tusks, one pair of which is ebony. Also of note in a side aisle is a small enthroned statue of King Taksin. The easiest way to reach Wat Chana Songkram is by boat to the Phra Arthit Pier. From the pier, its best to walk up past the Phra Sumen fort and through the park to Phra Arthit Road. Cross the road and head back down parallel to the river. You'll soon come to a large alley on your left with a few large guesthouses along it. Walk down this alley to the next road and the temple is right across the street. You'll be faced with a high blank wall, but just find one of the zig-zag gateways through it and into the kuti compound.